Multiply your deposit in 2 times! 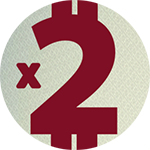 By your numerous requests, we have extended the promo “Double Deposit” till March 31, 2016. If you do not know how to increase your funds in 2 times, we will tell you! get +33% for further top-ups. you can withdraw bonus funds. Start the new year with double joy: connect to “Double Deposit” right now! Time is running — deposit is growing! Student trading from the third winner of the contest "Snow Ride 2016"